Are the Bears Right About Turtle Beach Stock? Some investors smell blood after the gaming headset maker’s 1,000% rally. Shares of Turtle Beach (NASDAQ:HEAR) traded at less than $2 at the beginning of the year but have since skyrocketed to over $20. That rally was sparked by surging demand for the company's wireless gaming headsets, which were buoyed by the rise of popular "battle royale" games like Fortnite and PUBG. A ten-bagger return for a hardware company is impressive, but it also attracted a lot of naysayers who claim that the company's short-term boom will eventually end in a brutal bust. Over 70% of Turtle Beach's shares available for trading were being shorted as of Oct. 9, making it one of the most shorted stocks on the U.S. market. Are the bears right about this stock, or are they in for a rude awakening? Turtle Beach was founded in 1975 as a maker of sound-editing software. In the late 1980s and 1990s, it expanded into the audio hardware and PC sound card markets. The company was subsequently acquired by ICS, which then sold it to Voyetra Technologies. The combined company, Voyetra Turtle Beach, was then acquired by a publicly-traded company, Parametric Sound Corporation, through a reverse merger in 2014. Parametric renamed itself Turtle Beach. However, the new company struggled with massive losses from Parametric's HyperSound business, which developed an immersive directional audio technology for digital signs, kiosks, consumer electronics, and hearing aids. The "new" Turtle Beach mostly focused on selling high-end gaming headsets for PCs and consoles, but Sony and Microsoft's introduction of first-party gaming headsets in 2013 wreaked havoc on Turtle Beach's core business. Other companies like Logitech (NASDAQ:LOGI) and Razer also saturated the market for PC gaming headsets. Those headwinds, along with the ongoing losses from HyperSound, caused Turtle Beach's bottom line to plunge deep into the red. But last October, Turtle Beach licensed its HyperSound technology to Waves Systems, which removed the unit's massive losses from its bottom line. In 2017, it released the first Xbox One-compatible wireless gaming headset just as the battle royale boom started. We can clearly see the impact of those two moves on the company's operating income growth. Turtle Beach controlled 45.5% of the console gaming headset market in the U.S. and Canada in June according to NPD, compared to a 39.8% share a year earlier. This indicates that the company has plenty of brand appeal and pricing power among gamers. Its gross margin also increased 30 basis points annually to 33.3% during the second quarter. During the quarter, Turtle Beach's revenue rose a whopping 218% to $60.8 million, marking an acceleration from its 185% growth in the first quarter. Turtle Beach expects its third quarter revenue to rise 103% to 106% (above its prior forecast for 81% growth) based on its preliminary report in mid-October. For the full year, it forecasts 71% revenue growth, but management expects to revise that figure upwards when it reports its third quarter results. Nearly all of that growth can be attributed to the surging popularity of "battle royale" titles like Epic Games' Fortnite and Bluehole's PUBG. These "last man standing" multiplayer shooters are optimized for gaming headsets, which allow gamers to communicate quickly with other players. Fortnite and PUBG are currently the second and fourth most popular core PC games worldwide, respectively, according to Newzoo's latest rankings. Fortnite. Image source: Epic Games. Turtle Beach's growth spurt and its pricing power helped it generate $6.3 million in net income ($0.40 per share) during the second quarter, compared to a loss of $7.1 million a year earlier. 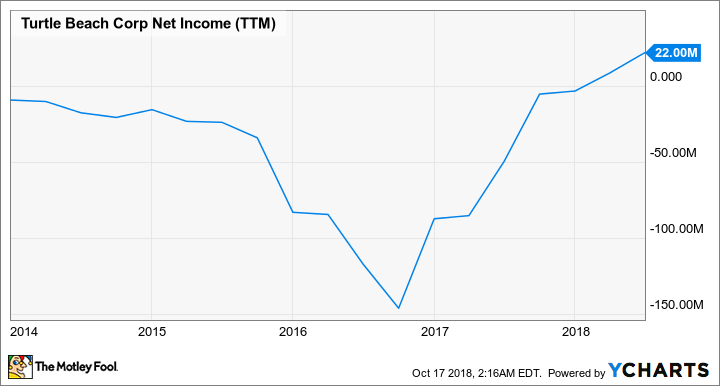 For the third quarter, the company has guided to earnings of $0.74 to $0.78 per share, compared to a loss of $0.10 in the prior-year quarter. Turtle Beach's recent growth is impressive, but its top line is already decelerating, and it could struggle if the popularity of the battle royale genre proves to be fleeting. It also faces tougher competition in the wireless gaming headset space from companies like Razer and LucidSound. When hungry rivals flood a saturated hardware market, it often ends badly for the market leaders. Therefore, it makes more sense to buy Logitech, which sells a much wider range of PC and gaming peripherals. 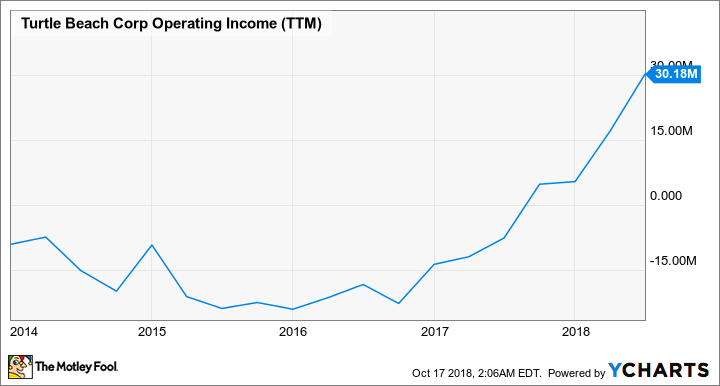 Logitech's expected growth rates (11% sales growth and 14% earnings growth) might not be as impressive as the triple-digit figures from Turtle Beach, but they're much more stable. Investors looking for a play on battle royale games can also buy Tencent, the diversified tech giant which owns a 40% stake in Epic Games and a 5% stake in Bluehole. The bears are probably right about Turtle Beach, which looks and smells like a fad stock. Most of the smart money was already made earlier this year, so investors should avoid this high-flyer unless the company diversifies its business and widens its moat.